1. The purpose of this proposed research is to address the shortcomings in Northeast strawberry production and develop strategies to improve economic sustainability through a new integrated farming model with aquaculture systems. The lack of standardization in hydroponic and aquaculture systems has created problems with reliable productivity, economic sustainability, and food safe. Economic sustainability will be addressed by optimizing production and therefor reducing inputs and in general costs associated with production. 2. The research approach of this project combines production strategies used by commercial growers with sustainable alternatives that fall under regenerative agriculture practices. Replacing a synthetically-derived nutrient source in traditional hydroponics with an aquaculture-based nutrient solution will improve the sustainability of hydroponic and aquaculture production by enabling a new form of integrated agriculture. Integration will also reduce the amount of agricultural waste discharge associated with both systems. This research will include the characterization of a naturally- derived nutrient solution developed using treated fish waste from ongoing research at UNH for strawberry production. This characterization will determine what, if any, supplementation of micronutrients will be required to optimize the solution specific to the needs of strawberries and establish a framework for integration with other crops in the future. 3. Research conclusions have not yet been established. 4. Thus far and into the future, this research will provide resources and knowledge for both farmers and researchers that is currently lacking. The project goes beyond the specific cultivation practices and techniques that are being assessed through the grant (eg. cultivar/substrate, nutrient solution, lighting requirements), but on a much broader scale looks at how systematically greenhouse strawberries can be economically viable and eventually produced on a large scale in the Northeast. Through outreach, I have been able to communicate the many opportunities for growth and expansion in the strawberry market to growers in the area. In the future, I would like to expand the conversation to wholesale markets in the Northeast, to get a better understanding on how their needs in terms of strawberry demands could be met through a more localized market. The overarching goal for this proposed research is to develop and disseminate the protocols necessary to provide Northeast farmers a competitive edge to successfully supply locally-grown strawberries year-round to the regional berry market. Utilizing the newly-constructed, replicated farm-scale research facilities at the UNH Kingman Farm, this research will develop a foundational understanding and practical solutions for the integration of hydroponic strawberry production with a naturally-derived nutrient source. 1. Compare three day-neutral cultivars using a standard hydroponic nutrient solution to evaluate performance under hydroponic conditions using soilless substrate. To best determine the most appropriate cultivar for use in CEA hydroponic systems, three varieties used commonly in the field will be evaluated under controlled hydroponic conditions. Data collected quantifying fruit yields, plant vigor and overall fruit quality (size, flavor, color) will be used to identify which cultivars exhibit superlative performance. 2.Establish the hydroponic nutrient requirements of the selected day-neutral strawberry cultivar, and develop a nutrient solution using a naturally-derived nutrient source. Once a cultivar is selected from Objective #1, a nutrient mass balance will be conducted to determine the temporal nutrient uptake requirements during the vegetative, flowering, and fruiting stages of development. The resulting nutrient requirements will then be used to develop a naturally-sourced nutrient solution through characterization and augmentation of the available macro- and micro-nutrients, and testing of the solution will quantify yield. 3. Evaluate the effect of daily light integral (DLI) on the selected day-neutral cultivar grown in CEA hydroponic systems. To determine the ideal amount of light from an economic and productivity perspective, three different lighting treatments (target DLIs) will be evaluated under controlled conditions. Research will focus on promoting flowering. Data collected will include environmental variables, plant quality (size, growth, nutritional health, etc. ), PAR (light intensity), and DLI. 4. Host a hands-on, technology transfer workshop for organic Northeast fruit and vegetable growers. In conjunction with annual aquaponic technology transfer workshops for farmers supported by funding from the USDA and New Hampshire Sea Grant, a workshop for CEA strawberry will be hosted for regional farmers. Workshops will provide hands-on training in the farm-scale hydroponic/aquaponic systems on propagation, substrates, drip irrigation, fertilization, runner production and general maintenance. A written guide will be provided for growers to take home for reference. There is a growing desire for produce in the United States to be grown sustainably and locally, and yet an uncertainty about regional production capacity due to environmental conditions and general farming practices. The majority of strawberry production in the US is located in California and Florida, where flood and drought conditions are on the rise. Due to weather uncertainties and an increase in regional demand for strawberries, an opportunity exists for expansion of the greenhouse strawberry industry in the Northeast where demand for local produce is increasing. The use of CEA in the Northeast during winter months could minimize possible market shortcomings and provide a new source for fresh, local produce year-round. Such market development would allow smaller- scale Northeast farms to compete with large conventional businesses in other areas of the US, thereby reducing the outsourcing of agricultural production. This research has the potential to result in one of the first certified organic hydroponic strawberry operation in the Northeast US. Organic certification of crops enables growers to charge premium prices, easing the financial burden of increased operating costs associated with heating and lighting greenhouses. The use of fertilizers from natural sources is required for organic certification. Aquaponic research (integrated aquaculture and hydroponic production) currently being conducted at UNH is focused on water treatment and the development of a naturally- derived nutrient solution for use directly in existing hydroponic systems. Objective 1: Evaluate the effect of substrate and cultivar on plant growth in hydroponically grown greenhouse strawberries. This experiment consisted of a split-plot+ randomized complete block (RCB) design with 3 strawberry cultivars (subplots) and 2 substrates (whole plots) for a total of 6 treatments. Plants were grown in Bato WAVE meter buckets (A.M.A Horticulture, Ontario), with six plants in each bucket, staggered so that plants were approximately 8 inches apart. There were six blocks in the experiment, each block consisting of two buckets, one filled with each substrate (BC5 and BC3). Of the six plants within each bucket, two plants of each cultivar were planted side-by-side, to avoid any competition between cultivars. In this design, substrate was assigned to whole plots using RCB design and cultivar was assigned to subplots using RCB design (blocked by substrate). 72 Strawberry fragariacv. Albion, Seascape, and San Andreas runners were propagated from mother plants on June 11th, 2018. Mother plants, primarily used for propagation, were planted on 4/1/2018. Runners were placed into Terra Plug Oasis Cubes (Smithers-Oasis, OH) and rooted in the propagation house at Macfarlane Greenhouses Research Facility for 14 days. The runner tips were irrigated through misters in a greenhouse. After two weeks, strawberry plugs were transported to Kingman Research Facility and transplanted into the Bato WAVE meter buckets. Buckets were placed in 10 ft long troughs that sat on a table that was on a 1-inch slant to allow leachate to drain out of buckets and collected at the end of the table. Leachate was not captured for reuse, and was drained into a large holding tank behind the greenhouse. Two lines of string were tightly tied to each end of the table and along both sides of each trough. String was used to separate fruit and runners to improve aeration and minimize the plant material that comes in direct contact with the soil. The BC3 and BC5 substrates were highly non-uniform with large aggregates of coir and peat throughout the media, and therefore unsuitable for the purpose of this study. Substrate was further mixed prior to potting to provide a more evenly uniform media. For the mixing process, substrates were poured into 44 gallon trash cans. A mortar mixer attached to a drill was used to break up all aggregates larger than 3cm in diameter. Water was then added to the substrate and further mixed to provide the media and plants with moisture upon planting. To determine a standardized irrigation protocol, two Meter buckets were filled and lightly compacted with each substrate and weighed, for a total of four buckets. The buckets were then placed into a drying oven at 65°C for 48 hours. After 48 hours, the plants were removed from the oven and weighed for a dry weight. The buckets were then watered until saturated (when the buckets were dripping water from underneath). Substrate was mixed within buckets until there were no dry spots. Buckets were then weighed for a wet weight. The wet weight was subtracted from the dry weight, and the difference was multiplied by .55 and added to the initial dry weight, to best predict the weight of the buckets at 55% saturation. The final weights were averaged between the two buckets. When all buckets were filled and wet to 55% saturation, soil moisture sensors were placed in four of the buckets (two in each substrate). Within the Wadsworth Environmental Seed Controller (Colorado, US), the soil moisture was manually entered at 55%. The strawberries were then watered once the saturation level was at 55% for 4 minutes. 6-3/8” Netafim Drip emitters with 5/3’’ irrigation tubing (Griffin Greenhouse Supply, Tewksbury, MA) were used to supply nutrient solution to the plants. The plants were fed Peters Professional 5-11-26 Hydroponic Solution (Dublin, OH) in Tank A, and Jack’s Professional Calcium Nitrate (JR Peters Inc., PA) in Tank B. The nutrients were mixed in stock solutions that were injected at a 1:100 rate using a .5-16 gallon/minute DosatronÒ(Dosatron USA, Fl). To ensure nutrient solution concentrations were accurate upon each mixing date, solution was collected from the sample port prior to irrigation. 500mL was of solution was samples and pH & EC were collected. The same thing was repeated two more times. If the samples were within the target range, nothing was changed. If not, Dosatron flows were adjusted until the target pH/EC were achieved. Strawberries were grown in a 10’x10’ space within a 30’x96’ triple polycarbonate greenhouse. The plot was located in the back right corner of the greenhouse, with at least 60cm between the wall and the table at any point. There was a vent (dimensions of vent) located at the end wall of the greenhouse, within the 10×10 area the plants were located. Roof and side vents were automatically opened and closed to maintain target temperature ranges throughout the study. The target temperatures had to be compromised at some points throughout the summer, with high daytime temperatures reaching well above the 30°C set cooling temperature. The greenhouse was heated when temperatures dropped below 18°C. Redusolâ(Redusystems, Chilliwack, B.C.) was painted on the entire surface of the greenhouse walls and roof to maintain cooler temperatures and less light intensity through the summer months. Once flower initiation has occurred, plants will be manually pollinated daily using a leaf blower. A leaf blower can be used as a substitute for bees and other natural pollinators by pollinating strawberry flowers through artificial wind that vibrates the flower to shed pollen from anthers to pistils (CEA Basics, University of Arizona). Each plant was exposed to wind produced by the leaf blower until the plant was visibly shook to ensure maximum efficacy. To avoid sticky pollen that is difficult to disperse, we did not artificially pollinate in early mornings (associated with high humidity and condensations). Rather, plants were pollinated daily between early and late afternoon. Yellow sticky cards were placed throughout the crop for the purpose of scouting, as well as pest removal. Fungus gnats (Bradysiaspp.) and thrips were managed by applying beneficial nematode Steinernema feltiae (Biobest Inc.) weekly to the pots at approximately 225 nematdoes per plant.Nematodes were distributed and mixed in water and applied to each pot (300 mL of solution per pot). Precautionary measures were taken to prevent thrips and whitefly establishment using Swirskii predatory mite sachets (Amblyseius swirskii, Biobest Inc.) and Encarsia cards. Slow-release Swirskii sachets were placed on every strawberry plant every 6-8 weeks, while Encarsia cards were placed on 2 plants per greenhouse every other week. Crysopa carnea(green lacewing) were used to control aphids, spider mites, whiteflies, and thrips. Crysopabran was sprinkled on strawberry leaves monthly. Phytoseiulus persimilis are predatory mites (bran formulation) that was sprinkled biweekly to plant leaves to control spider mites. All runners were removed every three weeks from all plants. Old leaves on the bottom of plants were removed from plants every three weeks. 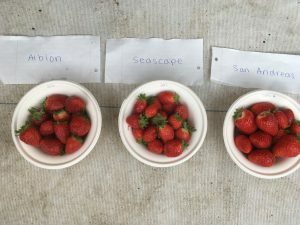 The following data was collected and used as metrics to compare the effect of cultivar and substrate on greenhouse strawberry yields. Agronomic Data- number of days to runner production, number of days to flower production, number of days to ripened fruit on all cultivars. Three days a week (Monday, Wednesday and Friday) through the duration of the study, data was collected on number of runners, flowers, and unripened fruit per plant. Fruit Yield- Ripened fruit was picked from all plants 3 days a week (Monday, Wednesday and Friday) from July 23rdto September 5th, 2018. Marketable fruit was defined as fruit with 80% red color development, weighed equal to or greater than 10g, and had no deformed fruit (Cantliffe et al., 2007). Data was collected on the number of ripened fruit per plant and the number of marketable fruit per plant. All ripened fruit harvested was weighed for a total ripe fruit weight per plant at each date. All data was analyzed using ANOVA one-way analysis. Statistical analyses where used for significance in the effects of substrate and cultivar on fruit yield, size, marketability, runner production, and flower production. When p-values between treatments were equal to or less than 0.05, additional Tukey HSD tests were run in JMP PRO 14.1. Experiment 2= Nutrient uptake of strawberry cultivar Albion using inorganic and organic nutrient solutions. Strawberry plants were grown from runners under three treatments: a hydroponic strawberry nutrient solution, an aquaponic nutrient solution and aquaponic nutrient solution with the addition of phosphoric acid. Nitrogen concentrations in all nutrient solutions were held around 70-85 ppm-N. The pH of the hydroponic and aquaponic with phosphoric acid were maintained around 5.5-6.0, but the untreated aquaponic nutrient solution held a much higher pH, around 6.5-7.2. The EC of all three solutions were maintained between 1.0-1.20mS. Data was collected on runner production, flower production, fruit yields, and overall marketability of fruit between all treatments. Additionally, fresh and dry weights were collected to evaluate overall plant vigor and biomass. Vegetative growth and fruit was dried and analyzed for a full macro and micronutrient analysis. We were interested in comparing the ability of solutions to uptake nutrients overtime. 3 nutrient solutionswith24 replicateplants grown in each nutrient solution. Each treatment was assigned to a table, 3 tables total (each with a different nutrient solution). This design was used due to space restrictions. Randomized samples were taken for a nutrient mass balance. 72 strawberry cv. Albion runners were propagated from mother plants (maintained at the Kingman Farm Research Greenhouse) on 9/17/18. Propagated runner tipswereharvestedfrom mother plants and rooted in Oasis root-cubes provided by Smithers-Oasis(Kent, OH), and rootedin the propagation house in Macfarlane for 14 days. The strawberry runner tips wereirrigated throughmisters in a greenhouse with no supplemental lighting. The greenhouse benchtop was set at 72°F and was heated when temperatures dropped below 68°F and cooled when temperatures rose above 78°F. Runners werethen transplanted into Classic 3008-inch potsfilled with HPCC mycorrhizae substrate (Pro-Mix) (Pots and substrate were purchased from Griffin Greenhouse Supply based in Tewksbury, MA). Plants were grown on 3, 3-foot tall tables at the Kingman Farm Greenhouses Research Facility under drip irrigation. Each table was irrigated with one of the three nutrient solution treatments. For the Yamazaki solution, an A/B irrigation systems was installed using two 19 L tanks each with a .5-16gallon/min dosatron®. For the aquaponic treatments, pvc pipes were installed to connect the aquaponic effluent to a pump. Tubing ran from the pump to the drip lines extended to each table. A third dosatronÒwas installed to the AQ+PA table to supply phosphoric acid to the aquaponic effluent to reach a target pH of 6.0. A tank was filled with 20mL of phosphoric acid and 19L of RO water and injected into the Dosatron at a rate of approximately 1-100. The rate of injection was slightly adjusted at every irrigation event to achieve a pH of 6.0, to account for the variation in pH of the aquaculture effluent. The aquaponic drip lines were checked every two weeks to ensure the emitters were not clogged with solids by removing emitters from each pot and running clear water. Irrigation was turned on and run until pots were saturated and dripping leachate through the bottom of the pot. Plants were irrigated at 55% saturation based on weight (when pots weigh 815g or less). To determine the average weight of all 72 pots, 3 pots from each tablewererandomly weighed and averagedevery other day. Tables/treatments were irrigated once the moisture content of the sample pots drop below 55%. The pour-thru method was used to monitor the pH and EC of the leachate of 5 pots per treatment. Saucers wereplaced under pots and approximately 300mL of DI water was supplied to each pot. Leachate wascollected in saucers underneath pots and then transferred to a beaker where pH and electrical conductivitywastested. PH wastested using a HannaHI98128 pHep®5 probe. The electrical conductivity wastested using Hach: Pocket Pro Low Range Conductivity Sensor. If pH and EC werenot within acceptable range,*set parameters* clear water wasrun through emitters until saturation occurred. High pressure sodium lights wereplaced above each table to ensure sufficient light throughout the fall and winter months. Lights werecontrolledto ensure a minimum of 15-20moles of photons per meter square perday wasachieved at amaximumof 16hour lighting cycle.Light accumulation was monitored using a PAR sensor and controlled using a Wadsworth Environmental Seed Controller (Colorado, US). Nutrient solutions wereapplied through the drip irrigationas described above. The following data wascollected and used as metrics to compare the effect of nutrient source on plant production. Nutrient Mass Balancewas established by monitoring nutrient input and output to quantify uptake by the plants. Plant/tissue samplesof 3 plants grown in each nutrient solution (total of 9 plants) were collected at three-timepoints; (1) at time of vegetative growth(2) during fruit productionand (3) at harvest, for a total of 27 full plant samples throughout the experiment . Additionally, 3 plant tissue samples were collected on the day of transplanting. Tissue samples wereseparated into vegetative plant and fruit, andweighed for a fresh weight. Samples were thendried in an oven for 48 hours at 65°Cand weighed to obtain adry weight. Dry samples wereground into a powder using a mortar and pestle, and transferred into a test tube for analysis. Samples weresent out weekly to JR Peters Inc. (Allentown, PA). Nutrient solution samples was taken at the time of each irrigation to observe macro and micronutrient levels of the nutrient solution input.200mL ofeach nutrient solutionwere collected and combined from four extra drip emitters using a 250 mL test tube and sent every week to JR Peters Inc. (Allentown, PA). Sampleswerestored at 4°C until shipment. Nutrients collected from the four extra drip emitters at each irrigation event were measured and averaged for an average input volume of solution to each pot. The mass balance calculations are based on the input (irrigation solution), output (leachate) and tissue samples (captured) at four time points (transplant, runner production, peak fruiting, harvest). Leachate was collected from each plant that was harvested for tissue analysis using clear 10-inch saucers. After 10 minutes, leachate from each pot was measured for a volume lost per pot. The volume lost was then subtracted from the input volume for a captured volume (or volume retained in the pot) for each plant sample. Leachate from each sample plant was collected in individual 5-gallon buckets. Leachate from every irrigation event was combined in their respective sample plant buckets. To prevent denitrification during storage, HCL wasadded to all nutrient solution samples containing Nitrogen to reduce the pH to 2.0. At a pH of 2.0, nitrogen in the form of ammonia, nitrite,and nitrate will be preserved. Agronomic Data- Number of days to runner production, # of days to flower production, # of days till ripened fruit(80% red coloration of an individual fruit) in all 3 nutrient treatmentswas observed and recorded. Fruit yield collectedtwice a week for 6 weeks from every plant. The number of fruit per plant, weight of fruit per plantand marketablefruit per plant wasrecorded at each harvest.Marketable fruit will be defined as fruit with 80% red color development, weighsequal to or greater than 10g, and has no deformed fruit(Cantliffe et al., 2007). Number of living plants was updated every two weeks for accuracy of data. To quantify the nutrient uptake of each strawberry plant, simple calculations were carried out. The leachate composition (nutrients collected in sample leachate*volume) was subtracted from the original input (nutrient solution*volume) irrigated to each pot to calculate the volume and composition of nutrient solution that remained in the pot. We will consider nutrient solution captured in the pot as solution that was taken up by the plant. Based on what was supplied to the plant, the composition of nutrients within the plant tissue and fruit was then analyzed to evaluate the nutrient uptake efficiency in the plants between the nutrient solutions. Comparisons were made on nutrient content in fruit based on size of fruit (g). Analyses were conducted using JMP pro 13.1 (SAS institute, Cary, NC). Effects of specific nutrient content (N, P, K) on growth yields will be tested in ANOVA. ANOVA test was used to determine if there was any significant variation in data due to environmental parameters, such as temperature. Effects of nutrient solution and specific nutrient concentrations on total runner production, fruit yield (marketable and unmarketable), fruit weight (g) was determined using Analysis of Variance in ANOVA. If significance amongst data was found (p value= 0.05 or less), Tukey HSD test will be run in JMP for specific details. Experiment 3= Evaluate the effects of Daily Light Integral (DLI) on day-neutral strawberry cultivars based on growth rates, yields, and marketability. The experiment consisted of a randomized complete block design with three lighting regimes and three replicate blocks of each lighting regime, for a total of 9 blocks. 9 strawberry plants were grown under each light fixture, for a total of 81 plants in the experiment. Plants were grown under 100% supplemental lighting. Ground cover (VMInnovations, Lincoln, NE) was used to block natural sunlight during the day. Plants were enclosed under ground cover 24 hours a day. Plants were grown in Classic300 8-inch pots (Griffins Greenhouse Supply, Tewksbury, MA) filled with HPCC mycorrhizae substrate (Pro-Mix, Quakertown, PA). Pots were spaced evenly 6 inches apart and 6 inches from the edges of the chamber walls. 81 Strawberry cv. Albion runners were propagated from mother plants on December 21st, 2018. Runners were placed into Terra Plug Oasis Cubes (Smithers-Oasis, OH) and rooted in the propagation house at Macfarlane Greenhouse Facility for 14 days. The runner tips were overhead irrigated using misters. From day 14 to day 21, plug plants were removed from the mist and overhead watered using a 5-11-26 standard Jacks Professional nutrient solution (JR Peters, PA) twice a day to ensure complete rooting of oasis cubes and provide an acclimation period to prevent shock. Plugs were then transplanted into media filled pots. Media was dampened with clear water prior to transplanting to provide saturation to the plants at the time of planting. ARC 600 LED full spectrum lights with integrated dimmers (HortLED, Ithaca, NY) were used for the study. All plants were exposed to a 16 hour photoperiod. Lights were set to one of three target DLI’s; 14, 20, or 26 mol·m-2·d-1with a light intensity of 260, 347, or 434 umol·m-2·s-1respectively. Ground cover was draped above each bench and light fixture to eliminate any outdoor light. Photosynthetically active radiation (PAR) was measured underneath the ground cover using a line quantum meter with ten integrated PAR sensors (MQ-301, Apogee, UT) to ensure equal light intensity was provided to each plant. To determine a standardized irrigation protocol, three pots were filled and lightly compacted with media and weighed. The pots were then placed into a drying oven at 65°C for 48 hours. After 48 hours, the pots were removed from the oven and weighed for a dry weight. The pots were then watered until saturated (when the pots were dripping water from underneath) and weighed. The wet weight was subtracted from the dry weight, and the difference was multiplied by .55 and added to the initial dry weight, to best predict the weight of the buckets at 55% saturation. The final weights were averaged between the three pots. Three randomly chosen pots within the experiment were weighed every other day, and watered when the average weight of the three pots was 55% saturation or below. A 3/8” Netafim Drip emitter with 5/3’’ irrigation tubing (Griffin Greenhouse Supply, Tewksbury, MA) was placed in every pot and used to supply nutrient solution to the plants. Zones for each lighting regime were created so that pots could be irrigated based on treatment. The plants were fed the Yamazaki nutrient solution. An A/B irrigation system was installed using two 19L tanks each with a 0.5-14 gallon/min dosatronÒ(Dosatron USA, Fl). To ensure nutrient solution concentrations were accurate upon each mixing date, solution was collected from the sample port prior to irrigation and pH & EC were recorded. Brix (total soluble solids) was measured in strawberry fruit for sugar content using the Hanna digital refractometer (model HI96801) (HannaÒInstruments, Woonsocket, RI). 9 fruit from each treatment were randomly sampled and cut into 4 pieces for replication. Quartered fruit were directly pressed onto the digital refractometer and data was recorded. Refractometer was cleaned using KimpwipesÒ(FisherScientific) after every sample. The following data was collected and used as metrics to compare the effect of light exposure on plant productivity and fruit quality. Fruit yield- Ripened fruit was collected twice a week from every plant for the duration of the study. Ripened fruit was characterized by 80% red color development. The number of fruit per plant, weight of fruit per plant and marketable fruit per plant was recorded at each harvest. Marketable fruit was defined as fruit that equals or is greater than 10g, and fruit that is not deformed or soft (Catliffe et al., 2007). The number of living plants was updated every two weeks for accuracy of data. Fruit Quality- Samples of fruit from each treatment was evaluated every two weeks based on sugar content (total soluble solids), measured in units of brix. Total soluble solids for each treatment was averaged between plants at each sampling date. Agronomic Data- Number of days to runner production, # of days to flower production, # of days till fruit emergence was observed and recorded under all treatments. Number of runners per plant was collected every two weeks. Project and data analysis for all three experiments are ongoing. No results are recorded to date. Over the past six months, I have participated in many on-farm consultations with farmers located in New Hampshire. During these visits, I was able to provide information/tools to growers, and gain knowledge through discussions about cultivation practices and plant productivity. Connecting with larger hydroponic operations such as Lef Farms (hydroponic lettuce production, Loudon, NH) and La Frissonante (strawberry greenhouse production, Quebec, Canada), we were able to discuss how precision of growing techniques in terms of nutrient application and growing media can have significant effects on yields and overall economic growth. I have also been consulting with smaller farms that are newer to the business and traditionally have limited access to the newest up-to-date research findings in the field. During these visits, I was able to provide information on broader system designs, such as what crops and cultivars are suitable to be grown in high tunnels during the winter months. Other information provided to aquaponic farms included how to keep clean systems (prevent algae growth, reduce pest pressure, reduce buildup of organic carbon through filtration, etc.). Additionally, we talked about how to check/monitor water quality/pH/electrical conductivity/dissolved oxygen in systems on a regular basis to maintain healthy plants and fish. I attended the Aquaponics Association annual conference this past fall, and gave an oral presentation on growing strawberries aquaponically. My advisor and I presented primarily on the environmental and economic benefits of Northeast greenhouse strawberry production, as well as system designs and nutrient requirements. Many growers from all over the world responded quite positively to the talk, and have reached out for more information since. I also gave a presentation to a panel of health care practitioners at hospitals in New Hampshire, who were interested in incorporating more local foods in hospitals, and specifically interested in integrating hydroponics into their facilities. This February, I will attending the North America Strawberry Growers Association Conference in Orlando, Fl, where I will be giving a poster presentation of my ongoing research. Here I will focus my presentation on ways to optimize aquaponic strawberry production. During this time, I will connect with other growers and researchers to work towards future collaboration endeavors. Through communication with growers all over the world, I will gain a better understanding of what research is needed and what some of the shortcomings in current production are. Over the past six months, I have also given tours of our hydroponic facility and the University Of New Hampshire to several groups, both small and big. Some of these groups include elementary school students in the area, and 4H camps for youth interested in growing plants. Additionally, I’ve given tours to farmers in the area that either have an existing hydroponic or aquaponic farm, or are interested in expanding/transitioning to the field. Currently, my advisor and I are connecting with collaborators (in the field of research and commercial growing), to coordinate a 3-day hands-on workshop for current and future hydroponic and aquaponic growers. The workshop is scheduled to be held in early June 2019. There will be a registration fee, but it will be open to any and all growers or researchers interested in learning more. The workshop will consist of an in-depth tour of our aquaponic/hydroponic facility, where we will give a detailed description of how the facility was built and why we chose the system designs that we did. We will then talk specifically about the lettuce production and strawberry production, and how we design systems differently based on crop needs. I will be giving a more focused talk on hydroponic and aquaponic strawberry production, with topics including, but not limited to: irrigation, substrates, nutrient requirement/uptake, supplemental lighting, temperature/humidity, harvesting, yields, pest control, pollination, etc. My goal is for new growers to leave feeling confident that they have the knowledge to establish their own greenhouse strawberry operation. Economic sustainability is addressed through this research by identifying the cultivars that will produce the highest yields and therefore greatest returns under such growing conditions. While data collection for this portion of the study is complete, results have not yet been statistically analyzed. From the raw data, we can see that all cultivars (Albion, Seascape, San Andreas) performed similarly in terms of yield. Under higher temperatures, the cultivar Seascapes’ marketability was greatly reduced due to abnormal fruit shape, texture, and ripening. No significant differences in quality/marketability were noted between San Andreas and Albion. The cultivar Albion was chosen for two additional studies, due to its success in commercial greenhouse production based on fruit size, quality, and flavor. Environmental sustainability has been addressed by identifying substrates that result in highest yields. Ideally, a substrate-less production system such as a deep water raft hydroponic system would be ideal for reducing farm inputs. 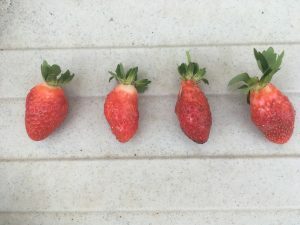 However, much research has shown that strawberries prefer a drier root zone, therefore deep water systems result in limitations to yields and productivity. Commonly used substrates in greenhouse plant production include, but are not limited to: peat moss, coconut coir, perlite, wood fiber, wood chips, char, rockwool, and compost. Finding a substrate, or combination thereof, that are environmentally sustainable and optimize production for specific crops requires more research. Our experiment tested widely adapted commercial substrates used for strawberry production, specifically those used in Quebec and Ontario where leading greenhouse strawberry production is located. The two substrates studied were similar, with peat and perlite in both. One of the substrates also included coconut coir, which has shown to be less expensive than peat and is not associated with the negative environmental impacts of harvesting peat bogs. The two substrates were not significantly different in regards to fruit yields. These results conclude that using a substrate with coconut coir can improve sustainability both environmentally and economically by reducing the amount of peat required. Seascape fruit deformation under temperatures above 90 degrees Fahrenheit. All three cultivars produced similar yields under the tested substrates. Objective 2 is currently underway with data collection in process. Objective 3 is currently underway with data collection in process. Objective 4: Hands-on workshop for farmers and researchers in the field of hydroponic, aquaponic, or greenhouse strawberry production. The workshop has not yet been held (scheduled for early June 2019), but is expected to include upwards of 50 farmers and researchers in the field. Our programs research and knowledge of sustainable systems will be shared with those who attend the conference. Equally exciting, the workshop will promote networking between strawberry and greenhouse researchers and farmers. This workshop has the potential to create a community for greenhouse strawberry producers where we can gain knowledge and work together in establishing what could be a hugely profitable market in the Northeast. During the workshop, we will collaborate on ways to develop a platform in which such conversations will be promoted moving forward. Since beginning this project, my knowledge of sustainable agriculture has expanded from countless discussions with farmers and researchers in the field of strawberry, aquaponic, hydroponic, and greenhouse production. The topic of sustainable agriculture in relation to controlled environment agriculture (CEA) is considered controversial to some. Where some aspects of CEA can be more sustainable than traditional farming (such as increased production of local foods), others may be less sustainable (increased energy requirements). Above all, what we do know is that with a changing climate, the implementation of CEA provides us with systems that can better withstand environmental changes that will undoubtedly affect what we can grow in the northeast. I have adapted to certain practices within my specific niche of research that I feel are improving the sustainability of greenhouse strawberry production. These practices are reflections of others work that has been shared with me throughout my graduate school experience, as well as my own discoveries through trial and error. For example, the concept of strawberries requiring less nitrogen than what had previously been thought has directly impact the way we operate our aquaponics facility. Reduction of nitrogen in the fish waste means that we are now feeding the fish less, and therefore reducing inputs onto the farm. In addition, using a crop like strawberries in a greenhouse has reduced the heating costs throughout the winter season. Currently, I am in the process of partnering with an agricultural engineer to establish a consulting business that incorporates our knowledge of horticulture and system designs. By doing so, we will not only help growers improve efficiency and increase productivity, but also work on R&D alongside farmers to eventually share with others. Additionally, after completing my master’s degree, I hope to work with or on a commercial operation to gain knowledge and experience with advanced greenhouse systems. I will be able to share my knowledge and skills gained working in greenhouse production and operating hydroponic and aquaponic systems to help improve commercial farms.